One of my worst habits on the bike, and sadly there are a few, is to hold tension in my shoulders while I’m riding. It doesn’t matter how often I tell myself to relax my shoulders, arms and hands I still find myself stiffening up in this area which leads to soreness and ongoing issues with the muscles in my upper back. So I thought it would be useful to share a few tips I’ve found on the subject which obviously apply equally to men and women. I’ll also continue to focus on these tips myself! Let it go – Consciously let go of the tension in your arms and shoulders by focusing on that part of your body while you are riding. I regularly check in with myself and literally tell myself to relax my shoulders. Shrugging every 15 minutes or so and relaxing your arms really helps relieve this stress. 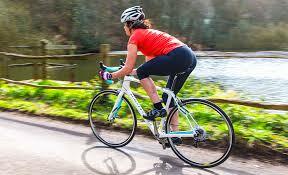 Bend your elbows – Always ride with your elbows bent and yours arms and shoulders relaxed. This prevents fatigue caused by muscle tension. It also allows your arms to absorb shock instead of transmitting it to your body. Relax your grip – on smooth, traffic-free roads, practise draping your hands over the handlebars. This will not only help alleviate muscle tension, but will also reduce the amount of vibration transmitted to your body. Don’t hunch – To avoid muscle soreness and fatigue, don’t hunch your shoulders. Tilt your head every few minutes to stave off tight neck muscles. You also get to admire the scenery as you whiz by. Change hand position regularly – Grasp the drops for descents or high-speed riding and the brake-lever hoods for relaxed cruising. On long climbs, hold the top of the handlebars to sit upright and open your chest for easier breathing. When standing, grasp the hoods lightly and gently rock the bike from side to side in sync with your pedal strokes. But always keep each thumb and finger closed around the hood or bar to prevent yourself from losing control if you hit an unexpected bump. Shake it – Occasionally take one hand off the handlebars and shake it. This relaxes your shoulder and elbow and encourages blood flow to your hand to prevent numbness. Make sure you have the right width bars – On a road bike, handlebar width should equal shoulder width (that’s why women’s specific bikes have narrower bars). Having your bars too wide or too narrow can lead to shoulder pain. Too much weight on your hands – If you suffer from numb hands while riding then you’re probably putting too much weight on your hands. You could consider raising your handlebars, shortening your stem, titling your saddle up or perhaps all three. Better still get yourself a professional bike fit and let someone who knows what they are doing sort out your problems. Buy yourself some good quality gloves – these will not only protect your hands if you hit the ground, they will also help absorb some of the shock from the road. With the added bonus of preventing sunburn. There are different levels of padding on offer including some new gloves from Specialized called Grail that have padding in the centre of your hand to even out the pressure on the handlebars. Strengthen and stretch your neck and shoulders off the bike – In order to keep the muscles loose and relaxed (also important to do while riding) and strong enough to support the amount of cycling you’re doing, cyclists should develop a consistent routine of strengthening and stretching exercises in order to stay pain free. Ask your personal trainer to add in some specific exercises or consider joining a yoga class.